Actors playing actors playing parts—bad parts, no less—require more than courage; they require the confidence that comes with undented dignity, and Kahn has put together a cast with just such a quality. 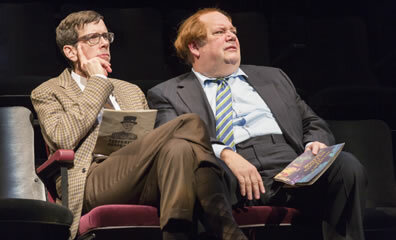 Shakespeare Theatre Company and the Guthrie Theater, Lansburgh Theatre, Washington, D.C.
Top: Critics Moon (Robert Stanton, left) and Birdboot (John Ahlin) talk in Tom Stoppard's The Real Inspector Hound. Bottom, from left: Critics Dangle (Ahlin), Sneer (Robert Dorfman) and Puff (Stanton) talk in Robert Brinsley Sheridan's The Critic. The two plays are a twin-bill production of the Shakespeare Theatre Company and Guthrie Theater. Photo by Scott Suchman, Shakespeare Theatre Company. 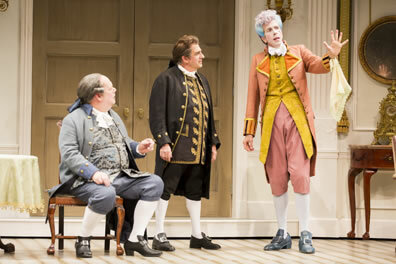 This twin bill of Richard Brinsley Sheridan's 1779 The Critic and Tom Stoppard's 1968 The Real Inspector Hound at the Shakespeare Theatre Company (STC) in Washington, D.C., pairs two plays with a peculiar similarity: both center on a pair of theater critics watching a play. This puts us reviewers on the spot, challenging us to engage in the discussion of our own relevance, motivations, and genus (that last is not a typo). STC has, in fact, prompted such a discussion, delving into the profession of literary and theater criticism in its ancillary material for this production co-produced with Minneapolis's Guthrie Theater (where it is heading after it finishes its run in Washington this month). The company even invited DC-area critics to participate in a survey called "A succinct and quick-witted examination of a venerated craft told by true masters" (proof that you feed a journalist to get them to like you but you stroke a critic). OK, I'll bite. I do so only because the point of Shakespeareances.com always has been to chronicle my personal interactions with theater in general and William Shakespeare in particular. So, if I write about my own experience with depression when describing a portrayal of Oberon, my own contact with warriors when discussing Othello, or my own memories of working as a motel night clerk when reviewing Eugene O'Neill's Hughie, then I might as well reflect on being a critic when watching The Critic. If nothing else, you'll learn a little about how I came to do what I'm doing right now—well, at this instant that I'm writing this, not necessarily the moment that you're reading this, when instead of being a critic I might very well be a sleeper or a cook or housecleaner or a drummer or a husband in the active sense rather than merely as a state of mind; though likely I'll be checking to see if anybody is reading this, which makes me still a critic even as you're reading this. As a critic I'm also expected to pass judgment on this production of The Critic and The Real Inspector Hound. That's easy: both plays are great fun, from the clever scripts to the comic performances. STC Artistic Director Michael Kahn steers the same cast through both plays, and he gets the actors to walk along the cliff's edge of absurdist humor, firmly footed in silliness without slipping into a chasm of ridiculous. Actors playing actors playing parts—bad parts, no less—require more than courage; they require the confidence that comes with undented dignity, and Kahn has put together a cast with just such a quality. Robert Dorfman is ostensibly the lead in both plays, playing Mr. Sneer the critic in The Critic and Inspector Hound in The Real Inspector Hound though he is not necessarily the real Inspector Hound. His fellow critic in The Critic is Mr. Dangle, played by John Ahlin, who also plays the veteran critic Birdboot in Hound. Birdboot's counterpart watching "Mystery at Muldoon Manor" is the second-string critic Moon, played by Robert Stanton who plays Mr. Puff, a journalist turned critic turned playwright of a play called "The Spanish Armada," in The Critic. Stanton's is the acting coup de théâtre of the twin bill, going from the self-absorbed but incredibly naïve Puff, wearing a blue-hair wig and pastel orange and yellow Georgian coat and knee breeches, to the overly insecure and ultra-philosophical Moon, hair combed down neatly to one side and wearing conservative brown-checked jacket, brown slacks, and boring brown tie. Naomi Jacobson similarly switches from the role of the dignified Mrs. Dangle in the first play to the suitably named Mrs. Drudge, the cliché of a housekeeper in the whodunit of the second play. Nevertheless, my especial applause goes to the actors playing the actors: Sandra Struthers, Charity Jones, John Catron, and Hugh Nees. Struthers is the over-acting young ingénue of both plays, Charity Jones is the under-acting noblewoman of both plays, and Catron plays multiple parts for which only his beard changes in "The Spanish Armada" while he turns in the ever-mugging madman and cad Simon Gascoyne in "Mystery at Muldoon Manor." Nees plays "The Spanish Armada" stage manager who is forced into taking the part of the Beefeater when another actor doesn't show, and then yet another role after he knocks out Catron's character in stage combat (forcing Nees's character to swordfight himself). Nees comes back as Major Magnus, a hard-boiled, wheelchair-using Canadian kin in "Mystery at Muldoon Manor" and ends up playing two parts in that play, too. (Beefeaters appear in both plays, as well, but not as part of the plot in Hound.) These actors suffer with great dignity such indignities—in addition to those I've already described—as having their clothes stripped off by the English Channel, playing insanely excessive insanity, being blasted by an oversize cannon, and performing the bad script of "Mystery at Muldoon Manor" twice. The design team does splendid work. Scenic Designer James Noone and Costume Designer Murell Horton do more than give us the accurate renderings of 18th century and 1960s London theaters; they also design the plays within the plays. For Horton, that means the sumptuous fashions of mid-20th century English country manor gentry for "Mystery at Muldoon Manor" and an iconographic outfit for Queen Elizabeth, representations of ships on the English Channel, and classic underwear for the "The Spanish Armada." Noone furnishes a mid-20th century English country manor and provides a real English Channel. 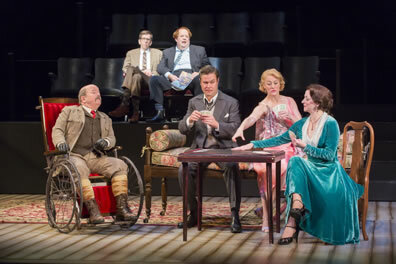 Now that I've dispensed with kudos for the production (and I assure you these are genuine kudos—the Lansburgh may as well be rechristened the Laughsburgh for the rest of the run), we turn to the matter of and in the plays themselves. The Critic gives us a historical perspective of theater criticism in that Sheridan's jokes at critics' expense are knowingly funny today (this could be more Hatcher's adaptation rather than the original text—I don't know enough about either to make the distinction). That perspective, though, goes beyond the realm of criticism to the world of journalism, and Sheridan takes sharper stabs at that profession: the critics upset that their notices have been pushed off the front pages by news stories on an impending invasion, and novice reporters who place style over substance. The latter is Mr. Puff, a man with zero journalism credentials who becomes London's most prolific newspaper writer thanks to what he calls "the art of Puffing." No matter the topic, all he concerns himself with is which of his half-dozen writing formulas to apply. Nor does the truth matter, as long as he can create a truth to bear out what he's written. That's how he became a playwright; as a critic he wrote a notice about a play that ended up not happening, so he wrote a play to fit the notice. While the first act of The Critic is a satirical look at critics of various stripes, the second act becomes a satire on theater itself in the long tradition of Shakespeare's A Midsummer Night's Dream around 1596, George Villiers The Rehearsal in 1671, Cole Porter's Kiss Me Kate in 1948, and Alejandro González Iñárritu's Birdman in 2014. As a prank, critics Dangle and Sneer watch a rehearsal of "The Spanish Armada," already an atrocious piece of work, with an eye toward sabotaging it by getting Puff to make key changes to it on the fly. They succeed in turning it into an even greater disaster, but their prank rebounds on them in the way William Hung became a pop music sensation by being awful in his American Idol audition. In The Real Inspector Hound, critics Moon and Birdboot are watching opening night of a play. While Sheridan wrote (and Kahn can stage) great satire, Stoppard writes great surrealism (and Kahn gets that, too). Stoppard had already taken on the theatrical arts as a time-and-space continuum of real life with Rosencrantz and Guildenstern are Dead, so when Birdboot asks Moon if the play has already started, and Moon replies that he thinks so, that's your first clue that you are heading for the surreal. As with Sheridan's play, Stoppard's piece seems to be a satire of critics (he was a critic earlier in his career) as Birdboot and Moon, speaking over, during, and around the action and dialogue of the play they are watching, emerge as archetypes. Moon only gets gigs when his paper's lead reviewer, Higgs, is not available, and this sends Moon off on a philosophical rant of whether he only exists when Higgs does not. Birdboot is the experienced practitioner, parlaying his influence on careers into gaining access to theater professionals, particularly the lovely actresses. While Moon gets anxious over his worth as a human being, let alone as a critic, Birdboot blows up over perceived attacks on his reputation, despite his apparent dalliance with lovely actresses. The two critics also begin drafting their reviews during the performance, and their evolving compositions reflect their psychological bents: Moon interprets the play's plot and characters as high-order allegorical musings, whereas Birdboot uses tried-and-true clichés to promote the play's viability as entertainment (this is all in conversation, so they keep talking past each other). Meanwhile, the play they are watching is unquestionably a hackneyed piece of work poorly played. Though the reviewers are watching a murder mystery, and a body has been lying on the stage floor all along, no actual murder is mentioned in the script and the body is totally ignored until the Clouseau-like Inspector Hound points it out. This is the moment at which we begin seeing how Stoppard has been shifting layers of reality all along, and the shift becomes seismic before long. Moon's existential ramblings become very real, and Birdboot's blurring of professional lines obliterates the theater's fourth wall. No spoiler alert here, but I will pose these questions. Does "Mystery at Muldoon Manor" entangle Moon and Birdboot or do they create their own play? And are Dangle and Sneer responsible for creating a hit out of "The Spanish Tragedy" by virtue of their creative input or their callous attitude? If you answer those questions with a yes, then you get to the heart of the role of criticism in theater arts. Top: Critics Dangle (John Ahlin) and Sneer (Robert Dorfman) chat with Puff (Robert Stanton) as they watch a rehearsal of "The Spanish Armada" featuring actors playing the English Channel (from left, Sandra Struthers, John Catron, and Charity Jones) in The Critic. Bottom, Critics Moon (Stanton) and Birdboot (Ahlin) watch "Mystery at Muldoon Manor" featuring, from left, Hugh Nees as Major Magnus, Catron as Simon Gascoyne, Struthers as Felicity Cunningham, and Jones as Cynthia Muldoon in The Real Inspector Hound. 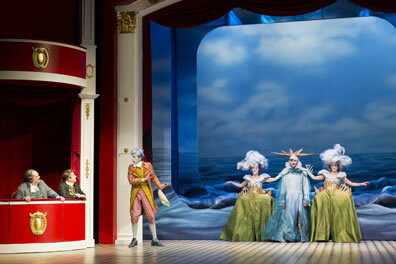 Photos by Scott Suchman, Shakespeare Theatre Company. Watching Moon, Birdboot, Dangle, and Sneer can make a critic uncomfortable. I see these types all around me, including in the mirror. I know critics who shamelessly praise everything in easily quotable phrases with the aim of self-promotion or as part of their publication's marketing efforts. I turn up my nose at these types as I keep on ethical guard against such practices (beyond the fact I tend not to write in sound bites—I'm more of a five-course wine-pairing meal kind of writer). However, I have to own up to the fact that when one of my praises ended up on an advertisement for a play, I framed it and hung it in my office. Birdboot not only brags about how one of his reviews has been permanently placed on a theater's marquee, he hands photographs of it to Moon, who then gives a most critic-like assessment of it. Since launching Shakespeareances.com, I've gained access to the inner sanctums of theaters, and I count impresarios, directors, and actors among my good friends—and among my sons, too. I am pretty sure my personal admiration for these individuals doesn't taint my professional assessment of their work because my heart has sunk watching them in some performances. In fact, I tend to compromise my ethics on the other side of the equation, apologizing in person as soon as I post the review (only to company directors, not individual actors: I do not discuss with an actor what I've written about that actor—they don't like it, and it leaves me too vulnerable). Furthermore, I have no delusions that I can advance anybody's theater career or that a lovely actress would consider me worthy to be used for a step up: fantasy, yes, delusion, no. As for Moon's penchant for waxing allegorical over the productions he reviews, well, Shakespeareances.com would be a mere Twitter account or Facebook page if I didn't do the same. My parallel with Mr. Puff is more damning in the fact that he became a critic with no qualifications. For that matter, I'm not sure whether Dangle, Sneer, Moon, or Birdboot came to their vocations with any bona fides. When I started Shakespeareances.com and "reporting" on the plays I attended, I saw myself as an essayist in the vein of George Bernard Shaw. But everybody else saw me as a reviewer; and, well, Shaw was a critic, wasn't he? My wife, Sarah, didn't help when she told people that my credentials lay in my experience as a professional music critic. But, how did I become a music critic? My first job out of college was as a copy editor for a daily newspaper, which needed somebody to do an interview with Charlie Daniels and review a Bruce Springsteen concert. Though my only qualifications were that I listened to a lot of music (but not Springsteen) and a willingness to work hard at learning, I stepped into a void previously occupied by a clueless high school kid. Yeah, not a high bar to be a critic of any sort, though I stretched out that gig through a total of seven years with four different newspapers and one magazine. One lesson from that experience I apply to Shakespeareances.com has to do with comp tickets. I thought it was an accepted part of the job until senior editors chastised me for compromising my objectivity (I actually didn't because, thinking that accepting promoter tickets was integral to the job, it never entered my thoughts when I wrote my reviews; I've since come to recognize the power of perception). So, though Shakespeareances.com is a non-profit venture (it's a non-income venture, in fact), I do not accept comp tickets to any play we attend, or if I must for reasons of the theater's ticketing process, I make a donation equal to the ticket price. This keeps me obligation-free and melds with Shakespeareances.com's mission to "advocate for dramatic arts and the prosperity of theater companies, playhouses, and education programs throughout the world." Ah, but doesn't that mission statement in and of itself compromise my ethics in some way? Here I am advocating that you see The Critic and The Real Inspector Hound, and regardless that I'm advocating on account that you really will have great fun, I'm promoting a theater's prosperity (two theaters, in fact). If you heed my advocacy, I'm going some way toward advancing one or more careers. Perhaps, too, the Lansburgh will rechristen itself the Laughsburgh for the rest of the run, and as the production moves to Guthrie we'll see "great fun!" (exclamation mark added) attributed to Shakespeareances.com on advertisements. If that happens, I'll add a picture of it to my office decor. So what does that make me?